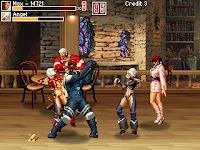 Beats of Rage is an open source arcade engine inspired by Sega's Street of Rage, but featuring ripped sprites from the King of Fighters series. Interest for Senile Team's debut effort is picking up again due to the excitement generated by their upcoming release, Age of the Beasts which will feature original work. The Windows executable should be downloaded from this page and used to play Beats of Rage, since running the DOS version on a modern PC will cause sound problems.